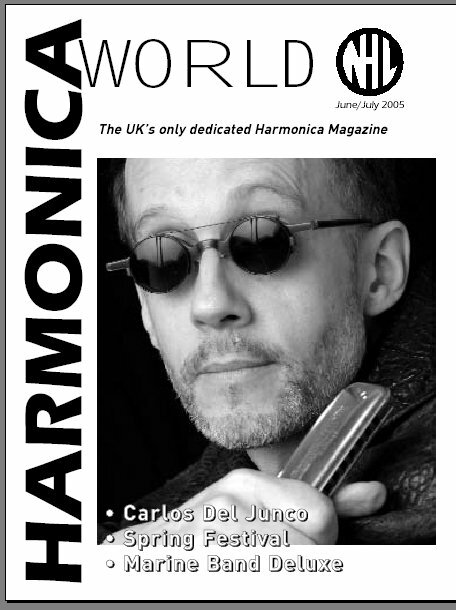 Harmonica World is published six times a year at the beginning of February, April, June, August, October and December. It is delivered free to all NHL members around the world. If you like what you see and want to join the NHL click here. 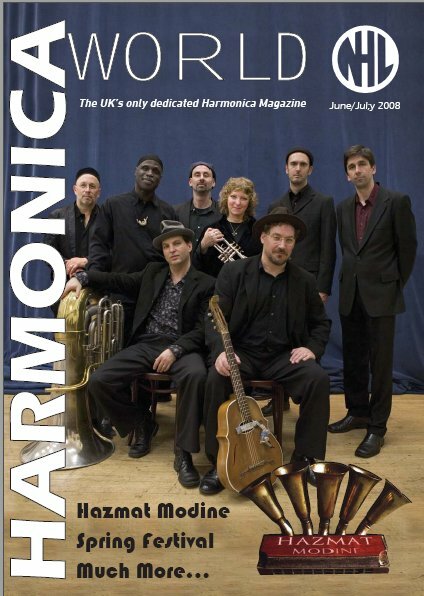 The A5 sized magazine usually has between 36 to 48 pages and has regular and occasional columns by well known harmonica artists (Brendan Power, Cheng Jang Ming, Tony Eyers, Steve Shaw/George Current, Pat Missin, Joe Filisko, Steve Baker, David Barrett, Liam Ward, Ross Garren, Rob Paparozzi, Richard Taylor, Steve Jennings, Richard Sleigh, Keith Parker... ), interviews with harmonica players, details about all NHL events and contests, some world wide events, blues and jazz jams, chromatic performance and techniques, people of interest, CD and book reviews, technical and repair information, news and material about anything related to the harmonica. 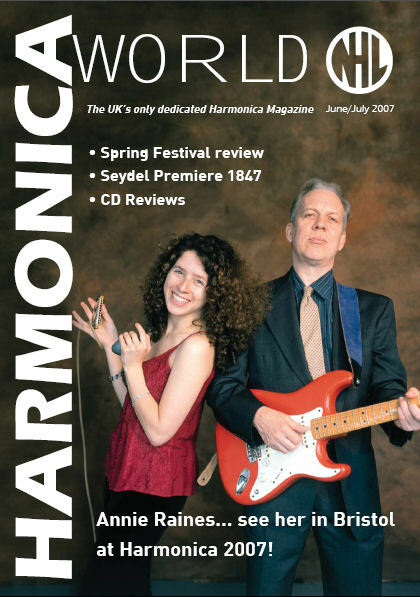 It also includes paid advertisements from suppliers of goods and services such as Hohner, Lee Oskar, Seydel, Tombo and Suzuki plus mail order companies. Any material submitted is filtered only by the availability of space and by editorial policy. Copy deadlines are the end of February, April, June, August, October and December. 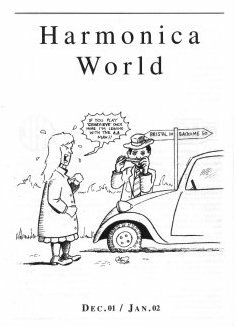 Contact Roger Trobridge for contributions or queries about the magazine and advertising in it. Here are some recent issues. Brendan Power - What Future for the APHF? Reviews - Pat Missin, Lee Oskar Low Keys, Brendan Power - Overblow Booster, Booster Bar and SlipSlider, Joe Filisko CD. Rory Smith - An Interview with Giles Robson. Richard Sleigh - Where Are You When You Practice? 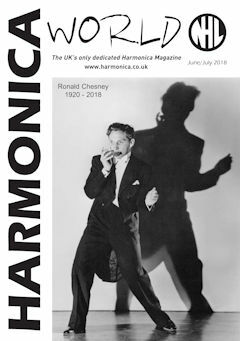 Ronald Chesney - 1920 to 2018 - In his own words. Reviews - Steve Baker, The Blues Band, Ilya Portnov, Sirius, Veloz. Reviews - Weeping Widows, Konstantin Kolesnichenko, Likho Duo, Steve Tracy & The Crawling Kingsnakes. Matt Henderson - 3am Pizza. Rob Paparozzi - Breakfast at Tiffany's, NYPO. J M Norton - Q&A with Michael Rubin - Pt2. George Current - Death of Jimmy Morgan, WW1. 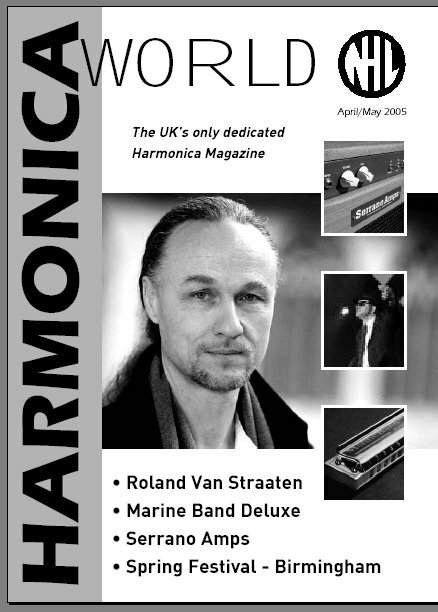 Richard Sleigh - Assess a Custom Diatonic Harmonica Pt1. Tony Eyers -Back from SPAH. George Current - Caller Herrin. Rowena Millar - Competition time - why do it?. 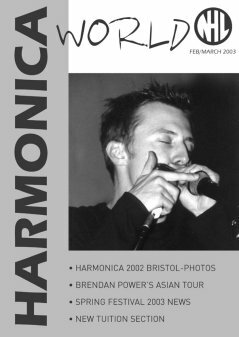 Brendan Power - Blowthrough Harmonicas. Greg Godden - Blues in Bucks. Neil Warren - Chromatic Weekend,. John Cooke - Dear John ... ?. J M. Norton - Q&A Michael Rubin. Richard Taylor - BOM - review. 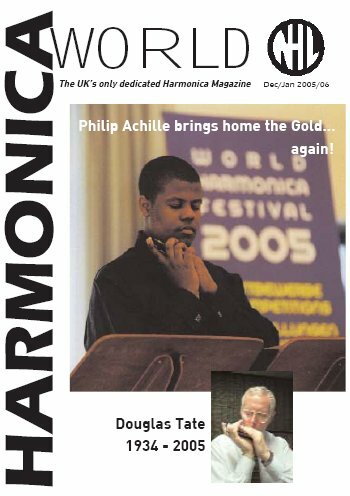 Richard Taylor/Norman Darwen - CD Reviews. Giovanni Volini - China visit. Tony Eyers - Off to SPAH. George Current - The Drunken Piper. Eva Hurt - When 2 meet 3. 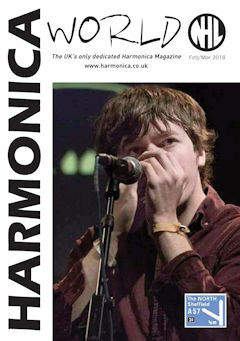 Sam Wilkinson - Harmonica Meeting in Wirral. Cathal Johnson - Irish Event. 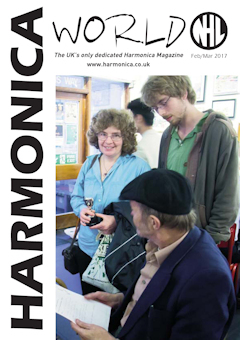 Chromatic Weekend 24-25 June 2017. 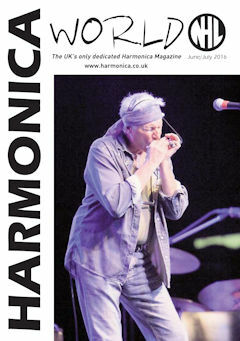 Kenny Horrocks - Harmonica Troubadour. 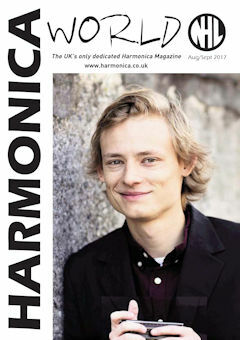 Richard Sleigh - David Barrett's Musical TAB. Jim Davis - The Harps of Kent. Pat Missin/Norman Darwen - CD Reviews. 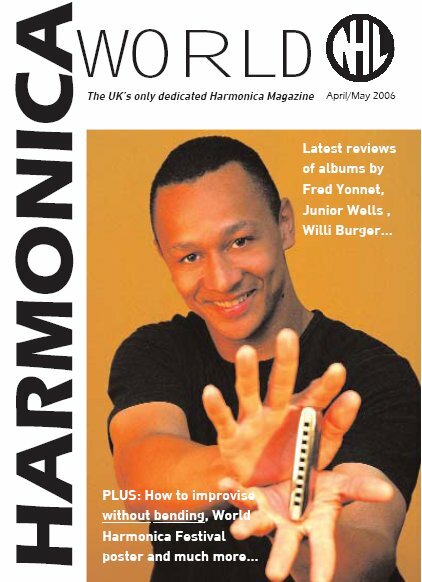 Tony Eyers - The Asian Tremolo. 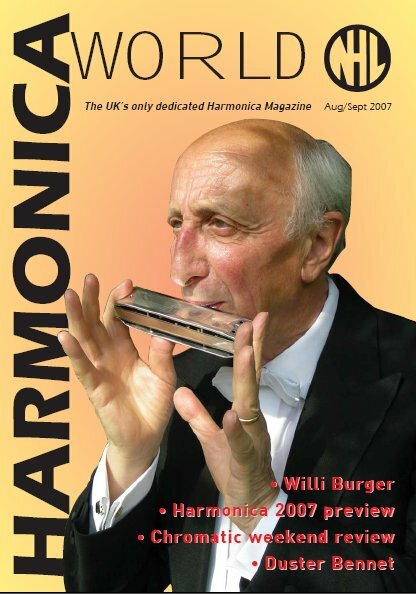 Mike Fairbairn - Harmonica Workshop - Nottingham. George Current - Celtic Music - Country Waltz. Hugh Barnett - Why should you enter the competion. Tony Eyers - The Incredible Switch. John Steele - Get yourself a gig. Ross Garren - Interview with PT Gazell - Part 2. Richard Taylor - Harpin' by the Sea. 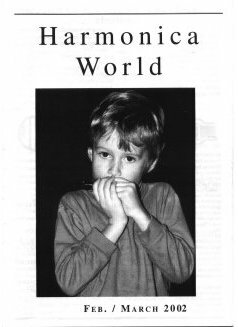 Brendan Power - The Shape-Shifter Harmonica. Neil Warren - Peavey H-SC CherryBomb mic. George Current - Celtic Music - Geordie Laddie. 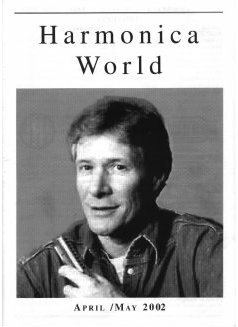 Jim Hughes - Help and Assistance. 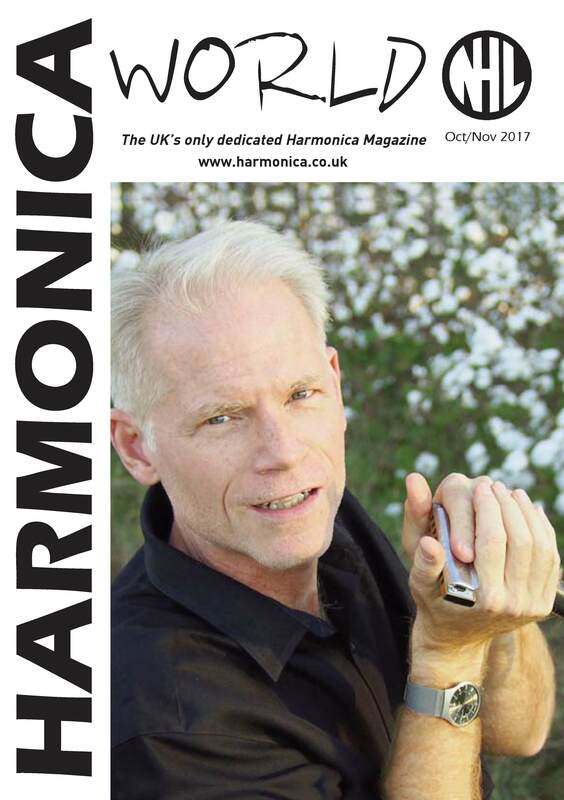 Tony Eyers - Major Cross - A New Type of Harmonica Model. David Barrett - Introduction to Blues Chromatic, Part 20. Ross Garren - Interview with PT Gazell - Part 1. Richard Sleigh - How to Truly Listen. 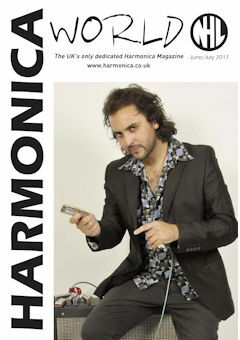 Brendan Power - The DM48 MIDI Harmonica. Pat Missin/Norman Darwen/Peter Golding - CD Reviews. NHL Festival 2016, Report, AGM, Contest. H2016 Festival Images of Concerts and Workshops. George Current - The Hills of Glenorchy. George Current - Campbell‘s Farewell to Redcastle. 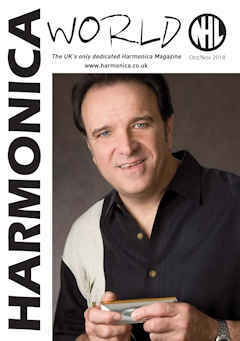 Link to the magazine music page. Brendan Power - That other Harp! 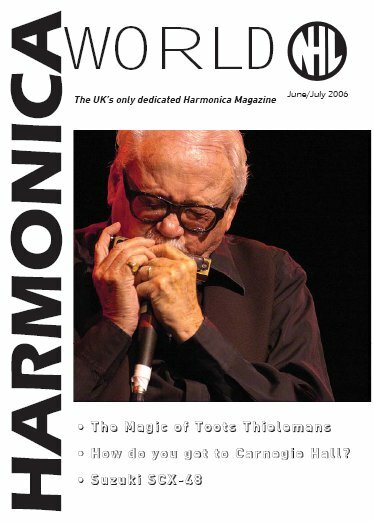 Reviews - Richard Sleigh DVD, Lee Oskar Ltd Edition and Harp Holder, CDs by Joe Filisko, Eric Noden, Roly Platt, Eddie Martin, Caribbean artists. Brendan Power - Whatâ€™s Wrong With The Harmonica? 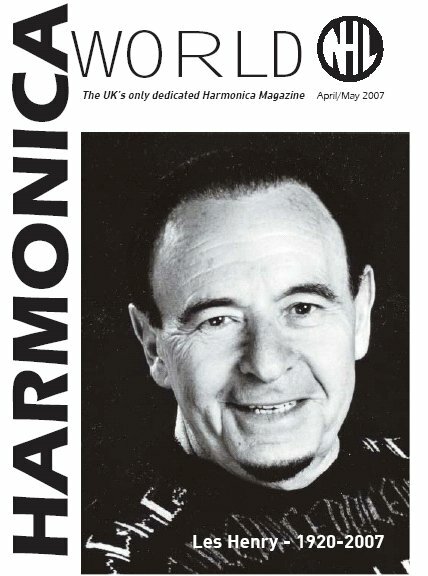 Colin Marshall - Obituary; A Tribute to Larry Adler. Brendan Power - Make Your Own Stretch Harps. 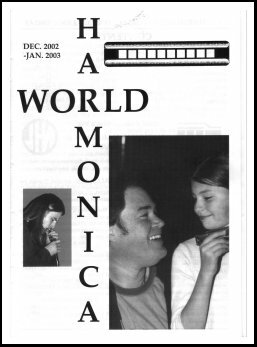 Tony Eyers - Harmonicas in Australia - Ray Grieve. Mat Walkate, Joe Powers, Muddy Waters Blues Band. Steve Shaw - Crisis? What crisis? 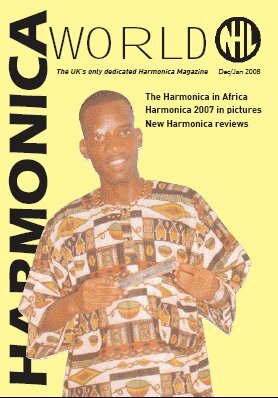 Brian Holland - Henry Samuels at The Bridge in 2003. Reviews - Repair Toolkits Pt2, Filip Jers, Eddie Armer, Steve Lockwood. Tony Eyers - What should I play? 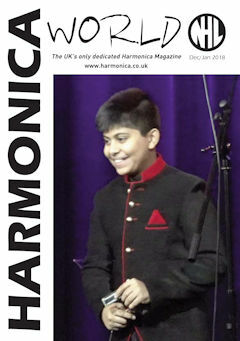 Steve Shaw - If you did not make it to Bristol ..
Steve Shaw - New Yearâ€™s resolutions - Two hornpipes - link to music page. 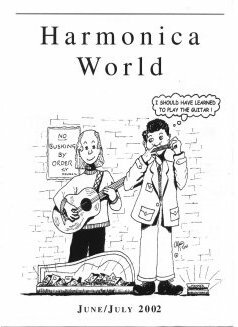 Steve Shaw - Two tunes by Turlough O'Carolan - click here for music files. 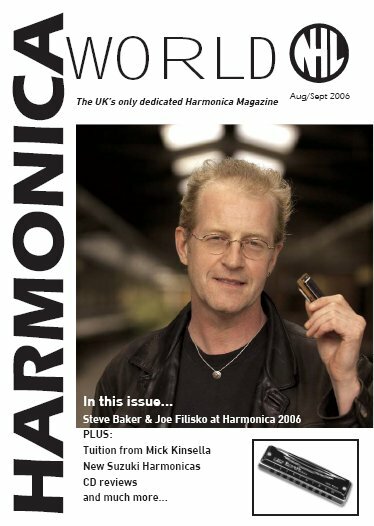 Steve Baker - Hohner Deluxe and Crossover - Behind the scenes. 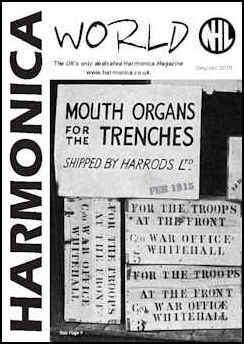 CDs - Irish music on Tremolo, Franz Chmel, .. Reviews - Instruction books by David Barrett and Ben Hewlett. 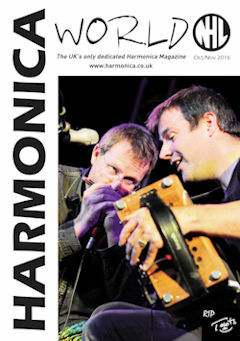 Steve Shaw reviews Play Irish Music on the Chromatic Harmonica by Brendan Power. 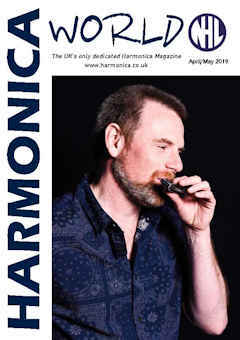 Fancy taking a harmonica exam? 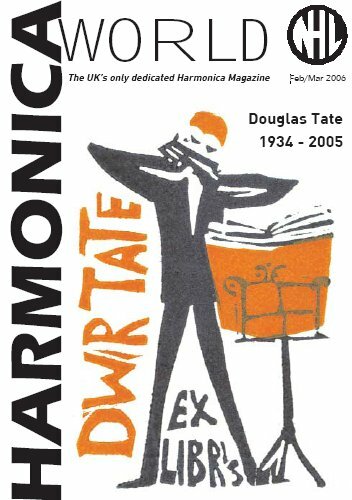 Music from Douglas Tate is available on the music page. Tuition: playing counter melodies by Pat Missin. Plus all your favourite regulars! Click here for the music files of the Mozart Concerto. Rick Epping on his visit to our Festival. 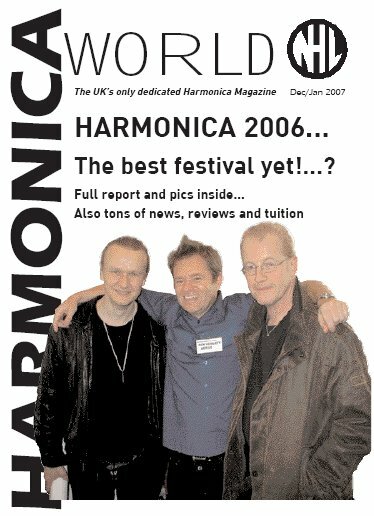 Review of Harmonica 2004, in Bristol, Oct 29-31. 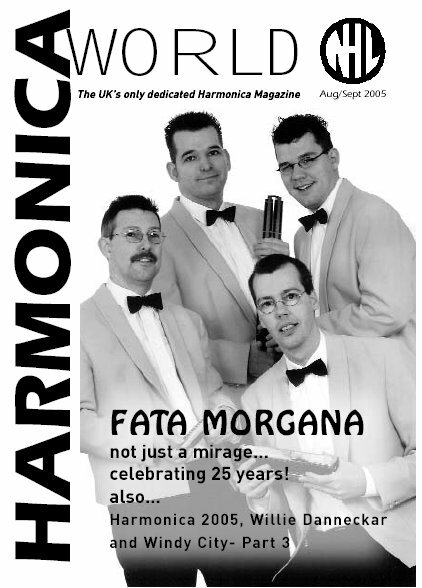 Reviews of "Harmonica Swing" and Four in Accord CDs. A Christmas Stocking of new CDs. News, and the Events diary. Some Christmas music with midi files. Brendan Power on the Asian Championships. Jens Bunge on the Asian Championships. 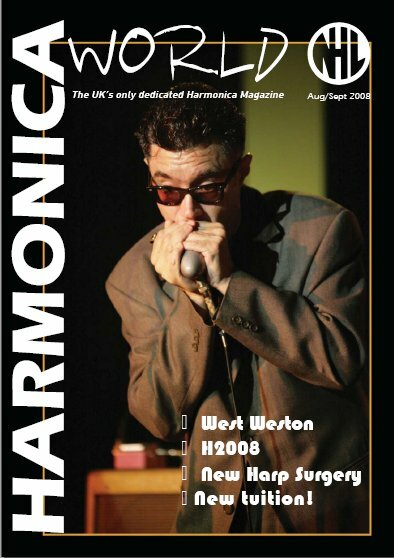 Full details of Harmonica 2004, in Bristol, Oct 29-31. 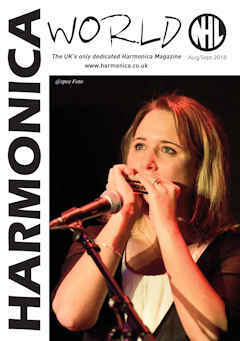 Reviews of the New Suzuki Suprano, Alto and Baritone harmonicas. Reviews of Rev Doc and the Congregation CD. Competition for Jefferson GonÃ§alves CD, GrÃ©ia. 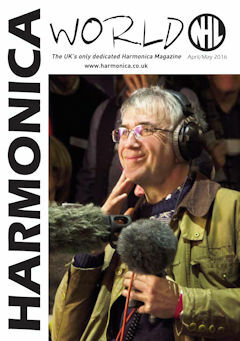 Click here for the midi file for The Lark in the Clear Air on Page 27. 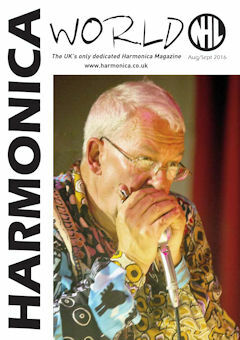 Brendan Power on Harmonicall, France. 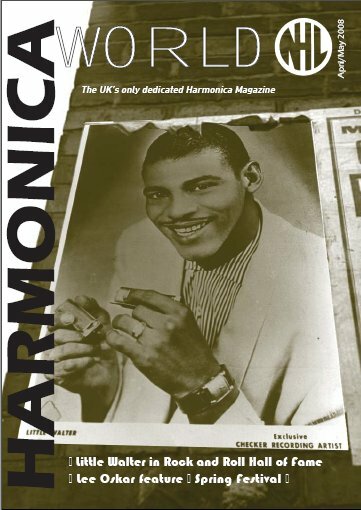 Eddie Armer on the Harmonica France festival. 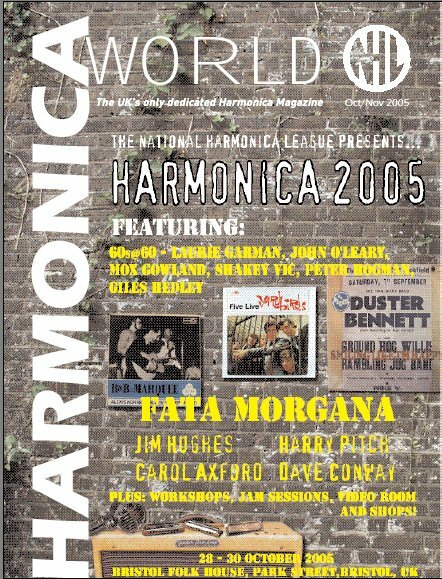 Details of Harmonica 2004, in Bristol, Oct 29-31. Interview with Charlie Musselwhite in London. Reviews of Charlie Musselwhite and Alan Glen CDs. Competition for Charlie Musselwhite's CD, Sanctuary. Brendan Power on the Denmark festival and Flip Jers. The Boomerang reissue and new harmonicas from Seidel. More from the Windy City pilgrimage. Bill Nighy - Harmonica Actually. 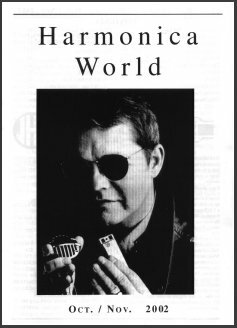 Competition for Harmonica Manufacturers book. 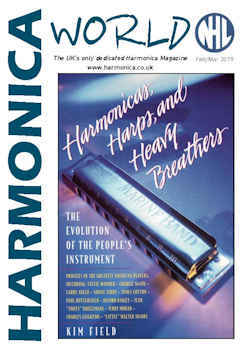 Click here for the music files for Exercise 2 on Page 27. Brendan Power on Rick Epping and Mick Kinsella. Dave Barrett - Practising for success. 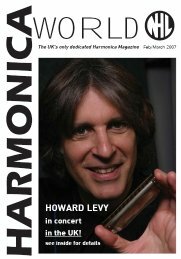 Report on his Harmonica Masterclass. Competition for Tommy Morgan CD. Click here for the music files for Exercise 1 on Page 26. Keith's homage to the Windy City. Send in your Subscriptions for 2004. 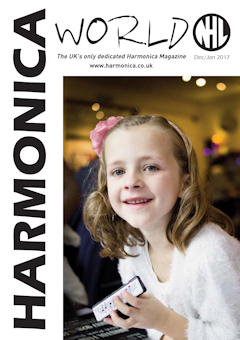 Click here for the midi files for In Dulce Jubilo music on Page 19. 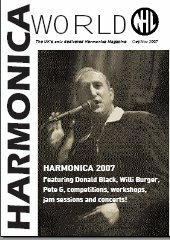 Harmonica 2003 - Festival Preview. Win a Tommy Reilly CD. Music for the Stella Artois Advert. William Galison visit to UK. Click here for the midi files for the Stella Artois article on Page 27. 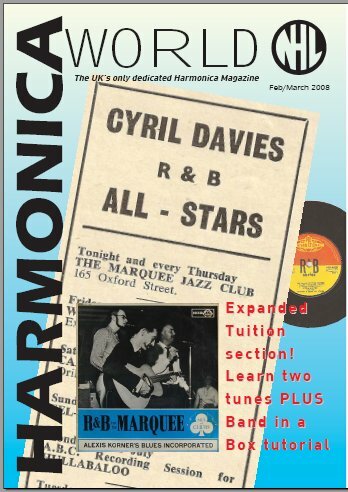 Tuition - Harmonica Note Layouts. 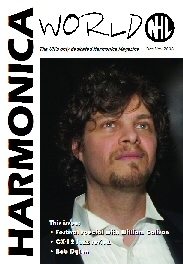 Click here for the midi files for the Sam Hall article on Page 27. Dates for Spring Festival 2003. 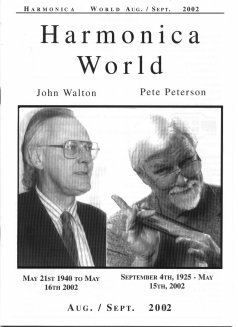 Obituaries for Pete Petersen and John Walton. Interview with William Galison by Cathi Norton. Review of the Spring Festival in Birmingham. Details of the annual festival in Bristol, Oct 18th -20th 2002. Editorial policy is to let the enthusiasts write about their interests. This has led to a balance of interest in the magazine that caters for all tastes. Policy is also to let contributors style stand, which makes for a more varied and interesting read. Editorial changes are made only if absolutely necessary. 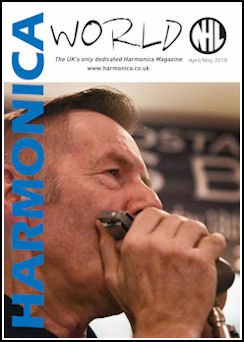 In order to make the magazine interesting for readers, the harmonica community, including the club members, is invited to submit articles of up to 1000 words for publication. Reviews, interviews and people profiles should be accompanied by a photograph of the person - portrait is preferred (meaning tall) rather than landscape. Generally photographs (or machine readable versions) are welcome. Space is often limited, so material might not always be used, but the editor likes to have a choice. Text should be PC machine readable, and there is a strong preference for plain text or real text format (rtf). Text can be cut and pasted into an email, or sent as an attachment. 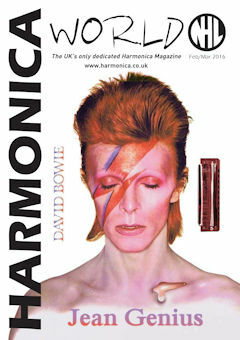 The magazine is printed in black and white, on gloss paper, with some colour pages, mainly for adverts. 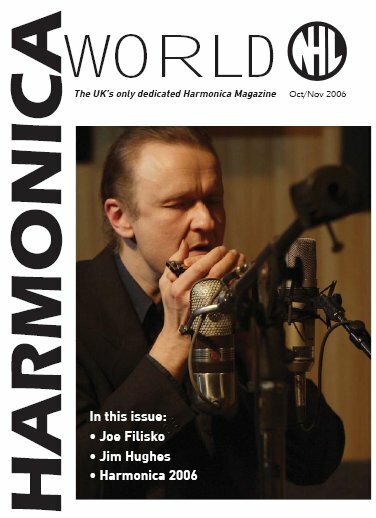 The size and number of pages of Harmonica World is basically fixed by the limits imposed by the postal charges.